victory because Alex Bennett won the race while Stanley Woods, the chief works rider, made the fastest lap (71 mph) before retiring with clutch trouble. Scarcely six months later, the works announced a client version, the CS1 (for "Cam Shaft One"). Norton claimed the CS1 was the fastest production machine ava ilable in its category. It was a faithful copy of the works bike, which had been clocked at 93.7 mph in the Isle of Man. Designed by Walter Moore (who designed a similar power unit for NSU), the single-cylinder CS1 engine was a long-stroke unit with a single shaft-and-bevel-driven overhead-camshaft. Primary transmission was by chain to a Sturmey Archer racing gearbox. The powertrain was housed in a new cradle frame instead of the diamond frame used with the previous Norton pushrod engine. The CSl could be supplied with a touring gearbox, fitted with a kick-starter and solo or sidecar gear ratios as well as with a closeratio box and no kick-starter. The generous drum brakes were reputedly copied from those of the 1926 version of the Ford Model T. The dry-sump lubrication was supplied by a gear pump mounted beneath the lower driving bevels of the camshaft drive. The CS1 remained in production in this form until 1932, when it was replaced by a road-going version of the famous International (which, while it retained the CS1 designation, had an entirely different engine). 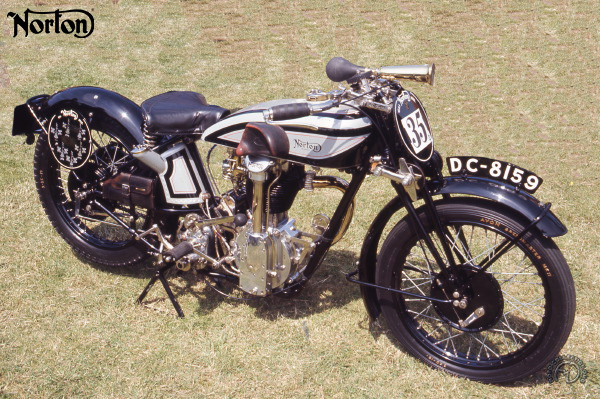 The Norton 500cc CSJ was incontestably one of the greatest sport bikes oft be 1920s.